The new Dell XPS 13 model is a real comeback for Dell into the top crop for modern, ultra-thin laptops. Only good deals are waiting for you when you choose to buy the Dell XPS, 13 model. Now Dell have raised their standards to be competitive with other high-end laptops. It is incredibly light but very solid. The performance is impeccably great. Strong machine for all sorts of jobs. Not very efficient for entertainment. The poor webcam is a low feature. Made with a compact package, the 13-inch screen laptop made it to the top crop of modern laptops for video editing and other professional tasks. Dell XPS 13 has beaten a host of its competitor’s thanks to its breathtaking combo of comfort, design, battery life and performance. Many have opined that this machine is a true deal from the world top laptop manufacturer, Dell. As tested, the bar has even been raised higher since Dell’s update on its XPS 13. The latest 7th generation Intel Core CPU (Kaby Lake) has beaten many of its competitors lying down. The machine has a wonderfully long battery life and a remarkably strong Wi-Fi performance. With the machine being available for even less than $1,000, Dell XPS 13 has stamped its mark as one of the most favorite machines in the market today. The aluminum machine comes in a thrilling finish of rose-gold for those willing to fork off a few more bucks. While the machine has been blamed on a few areas like the webcam, it has proven to offer a good deal to most of its users. The machine has faced stiff competition but not many, if not none, have made it past the Dell XPS 13 monster laptop. 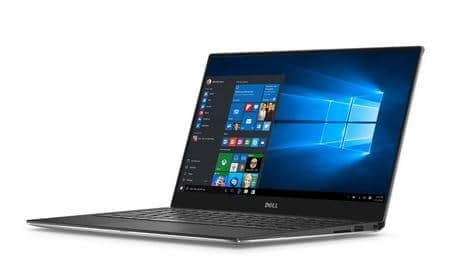 Since its debut in early 2015, Dell XPS 13 has established itself to be a favorite laptop for many. It has been reviewed as a brilliant deal in many respects. For many, it is true to say that Dell XPS 13 still rules the ultrabook roost. Well, from here, we delve into a number of aspects that will help you understand whether or not its competitors like the Lenovo IdeaPad 710S, HP Spectre x360, Razer Blade Stealth, and the Asus’ Zenbook UX310UA have been able to offer reliable alternatives. We all understand the need to look at the design of a machine before buying it. Well, when the manufacturer sat to craft the Dell XPS 13, it is without a doubt that the barely-there display bezel came out as its strongest point. This is the most prominent design trait in the machine. Until you have used the machine, you may never believe that the gap between the screen edges and the lid edges is barely a quarter an inch thick. Simply said, the machine has come closer the real ‘edge-to-edge’ display – and none of its competitors has come any closer. To put this into perspective, the XPS laptop is one foot wide and eight inches deep. Well, this is even half an inch narrower than the much-hyped MacBook Pro 13. I can already tell that many might be concerned with the machine’s performance and durability considering the compact design as mentioned above. Well, it only takes a single touch on this classy deal and your worries will be wiped away. The aluminum chassis and the carbon fiber are truly rigid. For various reasons, our review team feels this machine is designed to handle abuse even better than its competition. Finally, the design has to touch on the exteriors. This is a standard deal with a silver display lid when closed. Many have voiced their concern on differentiating the Dell XPS 13 and the Inspiron 700 series – as the model also backs on a silver metallic appeal. To resolve the dissent, Dell came up with rose-gold and gold models. The subtle color change gave the Dell XPS 13 a distinction of its pedigree. Both come in a soft-touch carbon fiber interior that is uniquely textured to bring out a feel of its kind. It will be noted that the new XPS 13 comes in a design that is not entirely new. 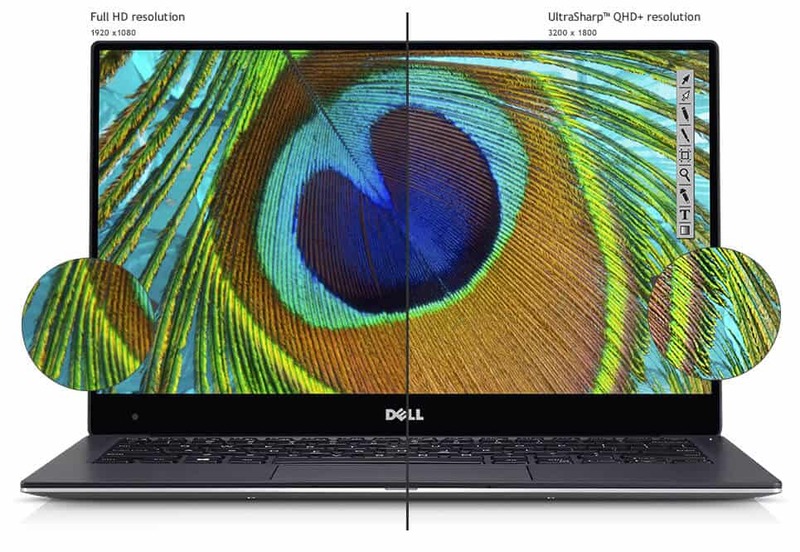 It has been around for awhile, but no one has been able to replicate the ‘InfinityEdge’ trademark better than Dell XPS 13. With the carbon-fiber on the palm rest makes it look awesome. The darker, metallic finish laptops have an issue with the palm rest – with age, it gets greasy. This is not the case with Dell’s design. Weighing at 1.29kg, the touchscreen Dell XPS 13 version is a truly portable model. The non-touch, matte model weighs 1.2kg. While there are other lighter models in the market, Dell took their time to deliver a compact and light machine that will not strain your back at all. The design comes with a pack of useful ports. It has 2 full-size USB 3.0 connectors and a single Thunderbolt 3/USB 3.1-C combination port. For high-power, high-bandwidth devices that have a 40GB/s throughput, the USB 3.1-C port can come in handy. It works best with high-end monitors and storage arrays. Our review team found this to be a perfect match for videographers. There is a CD slot and a 3.5mm headset jack. To check the battery charge level, there is a button on the left side. This is very useful when the machine is off. Unlike its rivals, there is a host of ports. For high-end users, MacBook Pro offers three more Thunderbolt 3 ports with Touch Bar. The small, backlit, chiclet keys are very notable on the standard Dell keyboard. It is designed to bring out a feeling of class. It is not overly cramped even with the reduced design. All the usual controls like the media playback, keyboard backlight, volume, and screen brightness among others are handled by the top row double up, as dedicated function keys. To be fair, the Dell XPS 13 touchpad is the best you can ever get in Windows laptops. It is closely responsive but not as good as the MacBook Pro version. There are reliable gestures, and its surface is smooth. It has dependable palm rejection – you can be sure to type with your palms resting on the touchpad corner and not a single rogue swipe or click. Not much has changed from the earlier version of the Dell XPS 13 model regarding the display. However, the new release comes with an option for either a High-DPI 3,200 x 1,800 touchscreen or a matte anti-glare Full HD panel. One thing is, however, constant regardless of the option you fancy: the display bezel is as minuscule. This is a feature that has thrashed all other competing models by far. During the review, I had the high-DPI model, and I can bet it is great. With over 5.7 million pixels on display, Windows 10 has done enough to scale the OS and applications in a sensible manner. This has made the apps look stunning, unlike its predecessors and competitors. With Dell XPS 13 display racking up a 1, 02:1 contrast ratio and reproducing 95% of the sRGB color gamut, the machine will deliver the finest text ever. We cannot wrap on display without mentioning that Dell has found a fix thanks to the QHD model. You can now toggle contrast on and off thanks to the firmware update from Dell. Unfortunately for the Full HD model, the manufacturer is yet to release a firmware update. If you need a dynamic contrast, then consider the QHD model. Our review comes in a backdrop of a handful of Dell XPS 13 reviews in recent years. The new editions come with a 7th generation Intel Core CPU, for the rose-gold option. This is a high-end model that packs a whopping Core i7-7500U. Other versions come with at most Core i5-7200U. Dell XPS 13 is not the most performing neither is it the least powerful machine in the competition. It is notable that the newly released 7th generation Cores were not aimed at hyping the performance. Its nearest competitor, the Asus Zenbook 3 knocks the Core i7-7500U with the same chip, although by a nick. It should be noted that new Dell XPS 13 models have a better fold compared to their preceding Core i7-6560U. From our review teams, Dell XPS 13 made it to the favorite as compared to other rival models. Majorly, the machine has a CPU in the tune of 3.1 GHz Intel Core i5-7200U, runs on Windows 10 Home and has a system memory (RAM) of 8GB. Even the Experts are in love with this Dell laptop. You can read the review by Mark Spoonauer on LaptopMag. It is their top overall laptop with 4.5 Rating. On Geekbench 3, the Core i5 model of the Dell XPS 13 scooped 7,159 while the overall performance for the Core i7 machine collected 7,915. The scores were solid enough as compared to the HP Spectre’s 6th generation Core i5 which scored 7,026. Most notably, the Dell XPS 13 blew up the Core m5-powered MacBook whose score was 5,906. The 7th generation Core i7 Lenovo Yoga 910 scored 7,988 beating both Dell XPS 13 versions.